* Speak out. Speak up. We want the lesson to be mainly speaking time in pairs or groups of 3. There will also be listenings in the text with comprehension questions. 10 - 15 minutes: Students do a beginning activity. This activity varies but we want students speaking. Students might ask and answer questions: listening to answers and asking more questions (a very important skill for normal conversation). The teacher will listen, help when needed and check the homework. 5 - 10 minutes: Student correct mistakes in their homework. If a student finishes quickly, they can continue on in their book. No time is wasted. 35 - 45 minutes: Use the text. For each unit, there is speaking pair work, readings (read out loud), listenings, grammar, vocabulary and comprehension questions. We want the lesson time to be mainly speaking and listening time so most written work is assigned for homework. English File Starter - English File 3: Depending on the writing and speaking level of the student. The texts mirror the grammar and vocabulary taught in Jr. High School lessons. It will help students in their studies at school and on tests. ***** Jr. High School students beginning in April of 1st year Jr High School with NO PREVIOUS English language education outside of elementary school will begin on My English Book and Me 5. Your lesson will resemble a high level elementary lesson. 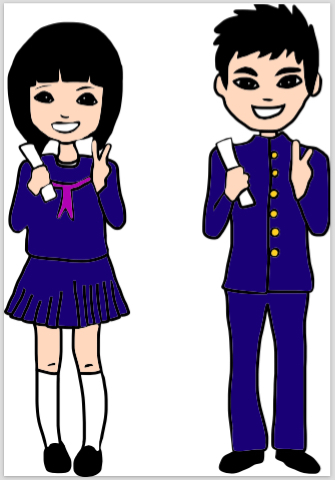 From October of Junior High School 1, you will change to English File Starter. Why?? Because English File Starter is TOO difficult for beginning Jr High School Students. But from October, your daily lessons of English at Jr. High School will make you ready for English File Starter.